"Most of us remember the first person who opened our eyes to a new way of thinking with regard to marketing. Maybe it was an author who spoke to us through the pages of a book, a speaker at an industry conference, or a relative who showed us the ropes of a dedicated family storefront. With an emphasis on the entrepreneurial spirit, we recently interviewed 20 successful small business men and women to get some insight into the teachers that mattered most to them over the years, as well as the truths that helped to set them on the path to winning in their chosen industry." Important Lesson: Develop content that truly solves your target audience’s problems and just get it out there — it doesn't have to be perfect, but it does have to be relevant, timely, and helpful. Important Lesson: Be the first to the space, and sell the experience and the relationship, not just the widget. Selling widgets is for the second place company, whose only option to gain market share is to compete on price. Important Lesson: There are only three ways to increase a business: increase the number of clients, increase the average size of the sale per client, and increase the number of times clients return and buy again. A mere 10 percent increase across the board expands our income by 33.1 percent. Important Lesson: Differentiation is key. Companies can’t try to do the same thing as the competition and do it better; they have to identify and promote what makes their product or service unique. Important Lesson: Co-marketing. Why go it alone? Co-marketing with other boutique businesses just makes good sense. Important Lesson: Don’t be afraid to ask. You can be perceived as a large company even with no marketing budget. Important Lesson: If you have a strong product, are passionate at what you do, you love people and your community, and you continue to learn (education, marketing and finances) how to run a successful boutique business, you'll thoroughly enjoy your job, continually have the opportunity to be a blessing to others, and survive — even flourish — in any economy. Important Lesson: Great creative matters. Important Lesson: You are what you publish. Every business has information that can contribute to the education of the market place. Marketing and PR pros need to think like publishers. Important Lesson: Instead of pitching and asking (how old school marketing is conducted), he is all about giving. He constantly gives, and as such, he is the center of every conversation. Important Lesson: The more you create this "force field" around you, the less you have to sell to potential clients, because they already know who you are and want to buy from you. The result is that fees are much less of an issue, and you can charge what you're worth. Important Lesson: You need to listen to your audience, and get to understand and know their viewpoint. If you can see things from their perspective, you can market ideas and services effectively. Important Lesson: We can really increase our marketing efforts without pushing a bigger marketing budget by being smarter with Analytics. Our Analytics told us there were several big friction points in our conversion funnel, so we did Usability testing and were able to double our conversion rate from last month! Important Lesson: "Keep plugging along" with your project. As entrepreneurs, we have days we wonder why we put so much effort into our businesses. I have seen exponential growth, however, and know as I keep on pushing, I'll keep on growing. Important Lesson: Focus on what your customers want to learn/buy and not what you have to sell them. Important Lesson: I've learned that I can be successful while authentic in my marketing, and it makes it so much more fun. Important Lesson: There is power in a team. Bringing a team approach to any project can catapult your business to another level. Important Lesson: Make all your decisions based on the results a particular marketing activity will generate. By doing so, you will be able to generate positive ROI and can invest only in marketing strategies that add to your bottom line. Important Lesson: In order to be creative, a person must be a consistently voracious and interested reader of all things. In short, everyone needs to read, a lot, everyday. Western Digital (WD), Lake Forest, Calif., introduced WD Photos photo viewer, an iPhone/iPod Touch app for use with its My Book World Edition and WD ShareSpace network drives, that lets users access up to 250,000 of their favorite photos from anywhere in the world. The WD Photos photo viewer app allows users to easily log in to their drive from anywhere so they can view their entire photo library. Users’ photos remain private, safe and secure in full high-resolution format, on their network drive, eliminating the need for painstaking uploads to costly online photo services and the need to choose which pictures to sync to their iPhone – with WD Photos photo viewer, they’re all instantly and easily accessible. The app’s powerful search tools, thumbnail previews and viewing options make it easy to find that special picture to show a friend at a coffee shop or remember a special moment. Users can view up to 250,000 pictures on their iPhone or iPod touch by simply copying their pictures into the “Shared Pictures” folder on their My Book World Edition network drive. A unique application that runs directly on these WD network drives automatically creates optimized versions of users’ photos ahead of time, enabling fast viewing on an iPhone or iPod touch without having to wait for the photos to load. Available now at the Apple iTunes App Store, the WD Photos photo viewer app is free. NYTimes mass photo project to capture "A Moment in Time"
This is a wonderful way to kick off National Photo Month in May. The goal is to create an entirely Web-built image of one moment in time across the world, and anyone with a camera (or even camera phone) is invited to submit images via a Web form that will be active from 11am EDT on Sunday, May 2 to 11am EDT on Friday, May 7. The assumption, of course, is that everyone will have a digital camera (or will have to scan in a film image) since submissions are only being accepted electronically. There are already over close to 8,000 photographers confirming they’ll participate, on the project’s Facebook page. In New York, it will be 11 o’clock on Sunday morning when the clock for Coordinated Universal Time — which carries the neither-English-nor-French abbreviation U.T.C. (it’s formerly Greenwich Mean Time) — reaches 15:00 hours. So some people will be settled into church pews while others prepare to head out to the park, if not the beach. Los Angeles will be a good deal quieter at such an early hour, except for some hard-partying types unwilling to concede that it’s no longer Saturday night. Lunch time will be at hand in Rio de Janeiro, dinner time in Cape Town. Dusk will be bringing an end to another tough day in Afghanistan, while midnight strikes in Beijing. For Australians, it will already be first thing Monday morning. Michele Goodbody-Osinski HOLY CANNOLI!!!! I put my 700+ photos in the mail to you on Tuesday 4/6 & received them & my CD of scans back already TODAY... THURSDAY 4/8!!! I am so excited to spread the news of your EXCELLENT service and know many who need your abilities! Thank you so much for providing a much-needed service (at least in MY world ;-)). Sara Yates Schiller Fabulous service and I was amazed at the turnaround time. The dvd is great and I'm so glad to have all these photos scanned now!! Thank you so much!!! Christian Hurley Incredible job -- you guys did fantastic work on a bunch of photos I sent a few weeks ago. I couldn't be happier with the results and now I know that if anything happens to the originals at least I have secure (backed-up!) copies! Rose Judd-Murray This was the best photo scanning experience I've ever had....quality work, affordable, and incredible customer service. Thank you for making a very difficult job bearable!! Mary Morse Larson Got my DVD on Friday - just sent my 1000 photos last Monday! So happy to get those photos scanned! And I have many more to go! Thanks for the great service! Sharon Watson Maughan You might be located in California, but you made this New Yorker very happy with five-day door-to-door service (amazing!) and your high quality scans. It's great to have so many pictures done so quickly at such a great price. Thanks! Jadelyn Rhodes Alvarez Got my order today! Great job! Speedy service...gotta start getting my next order ready...Thanks! David Nable Took a total of 3 days for my photos to get from NYC to Cali, get scanned and then returned back to me. Unbelievable. Great service guys. I'll definitely let my friends know about this. Click here to read more reviews and customer stories about how we helped to preserve and share all those favorite photo memories. This was a challenge. But, our "pay-one-price" photo restoration costs $39.95 - no matter how damaged it is - an d we promise that it is easy to order online. And it was. This photo on the left was the original and required ultra-heavy repair, be we had a mission because every picture is special and deserves a face lift to restore those special memories. Look around at all those faded, water damaged and special photographs that are calling out for some TLC. Since 1990, we have been performing this magic for customers worldwide. To place your photo restoration orders from photos we previously scanned, or pictures you have digitized yourself, click here. Also visit ScanMyPhotos.com for hundreds of other photo preservation and sharing services. "I have to tell you that the recent restoration that you did for me of my friend's sister is nothing short of amazing. Although I expected some significant improvement on what you were given to work with, I never dreamed that you would produce the quality of the restoration. It is absolutely awesome. In a previous email, you ask if you might use the picture as a before and after and I think that would be great, and encourage you to do so. Thanks for the quick turn around and great job!" As part of our 20-year commitment to always be innovative, trend setters and on the cutting-edge of new technologies, ScanMyPhotos.com announces the launch of an entirely new photo retail experience. Visit us today at our Irvine, California retail photo center to experience the future of photography. We call it The KODAK Experience and it is eco-friendly and chemical free. No more film developing or chemicals, thanks to KODAK's new APEX retail printing solution.The KODAK Experience is modern, smart and boasts extraordinary color and professional quality photo products that you have come to expect from Kodak," explained Mitch Goldstone, president and CEO of ScanMYPhotos.com and 30 Minute Photos Etc.Photography ha s been redefined by integrating a new way to make photographic pictures and 100s of other custom photo products. It leverages proven KODAK technology to maximize the customer experience and is efficient and eco-friendly. The new printing solutions are showcased at ScanMyPhotos.com at their retail photo center in southern California. Click here for directions and more info. Using banks of KODAK Picture Kiosks and installing KODAK Adaptive Picture Exchange (APEX) thermal dry lab systems as our new in-store photofinishing service is more cost effective and creates a more sustainable retail environment, while allowing our customers to enjoy top-of-the-line premium KODAK print and pho to creation products. KODAK's Multi-Station Kiosk technology allows 30 Minute Photos Etc. [ScanMyPhotos.com] to maximize the consumer experience. KODAK's APEX dry lab provides a scalable and modular photo processing solutio n. APEX requires less operating space than traditional Noritsu wet labs. Additionally, APEX is energy efficient, consuming 70 to 90 percent less energy than wet labs. The time required to activate, operate and maintain the system is greatly reduced due to the elimination of processing chemicals, water and other supplies used in wet labs. Thanks to dry lab technology, APEX offers improved air quality and lower greenhouse gas emissions. Given the dramatically lower utility costs and the elimination of processing chemicals, APEX is among the most efficient and environmentally-conscious retail printing solutions on the market. The KODAK kiosks provide new ways to make and share photos. These premium products include: KODAK Picture Movie DVDs, KODAK Picture CDs, photo books, calendars, photo collages, announcements and greeting cards. Prepared by TakeGreatPictures.com. For more tips, visit http://www.takegreatpictures.com/. Saw this KodakTube video. Kodak loves Babies and is a proud partner of the movie BABIES coming to theatres Mother's Day Weekend. Summary: Everybody loves... BABIES. This visually stunning new movie simultaneously follows four babies around the world - from first breath to first steps. From Mongolia to Namibia to San Francisco to Tokyo, BABIES joyfully captures on film the earliest stages of the journey of humanity that are at once unique and universal to us all. The children are, respectively, in order of on-screen introduction: Ponijao, who lives with her family near Opuwo, Namibia; Bayarjargal, who resides with his family in Mongolia, near Bayanchandmani; Mari, who lives with her family in Tokyo, Japan; and Hattie, who resides with her family in the United States, in San Francisco. Amazing American Idol presentation with first-of-its-kind theatrical laser display by Adam Lambert, singing ""Whataya Want From Me." "Sharon Watson Maughan: You might be located in California, but you made this New Yorker very happy with five-day door-to-door service (amazing!) and your high quality scans. It's great to have so many pictures done so quickly at such a great price. Thanks!" Get out your cameras, and get ready for May! It is time to start thinking about upcoming graduations. Everyone has images embedded in their heads of the graduate standing with a friend, showing off their diplomas; but how about making some interesting images to go along with the “must haves” shots? Be ready for the i mportant shot. All grads throw their hats up in the air, so you need to be ready before it happens. It is best to be on higher ground to capture this image; a car makes a great stepladder in a pinch. Take a shot before the activities begin. The day goes by so quickly. The s tudent in this photo and her friends helped set up the auditorium before the guests arrived. They posed for some silly, but memorable, images that will make it fun when looking back. It can be wonderful to remember a room you may have sat in for years before graduation day. It is nice to see it in a quiet state. Yearbook signings around campus are an important end-of-the-year event. Keep your eyes open and look for images that will spark future memories. Not all pictures have to include people. Take the opportunity to make a beautiful still-life photo showing bouquets the girls carry during a high school graduation ceremony. Use different types of poses. Showing hands and a program is a lovely way to express feelings of joy and thought, while showing the school name to give a sense of place. Next week, we are launching several updates to our most popular online photo ordering service at ScanMyPhotos.com. Check back to see all types of new features at this link. Click here to visit your new customized online photo service. This is an ideal way to share and do things with your newly scanned photos, slides and negatives. MASSIVELY enhanced sharing of Ready-To-Order (RTO) Specialty Products and albums. Now share to over 200 social networking sites, including Facebook, MySpace and Twitter. Public sharing of Ready-To-Order Specialty Products and albums. Shortened sharing links that make posting and sharing RTO products and albums easy. Create a Specialty Product from photos in multiple albums. More Specialty Product options and opportunities for friends and family to share and collaborate on Specialty Products. Anonymous ordering is back! You can place orders without logging in. The ScanMyPhotos.com fastest Online Photo Lab - Order Kodak-quality pictures, photo books and more online. Same day pickup/delivery. All New Photo Experience: Just for you, our redesigned online photo and photo gift service to create reall Kodak pictures from you digital images. PhotoCentral 3 is the exciting new, improved online service from ScanMyPhotos.com that lets you View, Edit, Share, Print and Archive your digital photos. PhotoCentral 3 features an all-new, tabbed interface that simplifies navigation and online ordering. Orders are ready in minutes at our Orange County, California retail photo center, or mailed back the same business day. The hundreds of unique products and features from our retail photo kiosks are now easy to load onto your computer. In minutes, you design super-easy photo books, 4x8 photo greeting cards, 5x7 folded cards and hundred of other innovative and extraordinary products to share and save your photo memories. UPLOAD YOUR PHOTOS: Upload your photos to our site, create albums to order prints from or share with others. It's the quick and easy way to let others view your photos of family and friends or that special occasion, such as a wedding, vacation or birthday. PRINT YOUR PHOTOS: Choose the photos you want to print, what size and quantity you want. 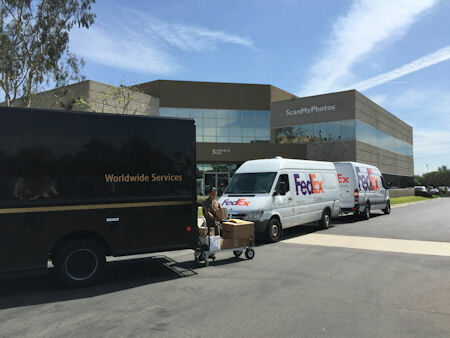 Hit send and your order is sent to our Irvine, California headquarters for processing. 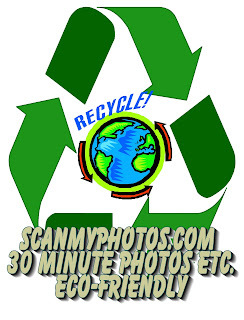 All orders received at ScanMyPhotos.com by 2PM Pacific Time, Monday - Friday, will be printed the same day. Everyone loves to share his or her pictures. But not everyone is as careful with your prints as you are. You want to protect them for years to come. Don’t worry! Prints from ScanMyPhotos are coated with KODAK XTRALIFEtm lamination to be especially durable. Real KODAK pictures with XTRALIFEtm lamination are waterproof. Just wiped the water off — no damage to the quality of the picture. So fingerprints, smudges, liquids, and even mustard will wipe right off. PHOTO GREETING CARDS: Photo greeting cards are a great way to share your photos. Custom cards for every occasion and holiday. Create the traditional one-sided 4x8 photo card or all new custom 5x7 folded cards with your photos and your custom text. It's like having your own greeting card company at your fingertips. Envelopes are included with every order and cards are as low as 59 cents per card. EDIT YOUR PHOTOS: Our new store lets you crop, zoom, pan, grayscale, and antique your online photos. You can even remove red-eye with one button click. You can undo any edits and even revert to the original photo at any time. The new interface features a new WYSIWYG (what you see is what you get) photo-cropping tool that's part of the Print Order page. You can now crop your photos, in the aspect ratio of the print size just ordered, without leaving the Print Order page. SHARE, TAG & BLOG YOUR PHOTOS: You can share any album to a family member or friend with your customized message and even features an Address Book where you can define groups like My Friends, My Family, Baseball Mothers, etc… - you can share to everyone in any group with a single click. You can specify the caption, people, event, date, place, and even rate your online photos. We call this photo tagging. And you can search your albums and albums shared to you for matches to these tags. It will display the found photos in a custom view – you can even save this view to a new album. And share it! Album owners and their share recipients can add a running commentary to any photo in an album. We call them Yaks. And anytime a yak has been added to a photo, the owner and last yakker get notified by email. The recipient clicks a link in the email and gets sent directly to the yakked photo. WINDOWS & MAC FRIENDLY: The look, the feel, and the fun of the new ScanMyPhotos are identical on Macintosh and Windows computers using Internet Explorer, Firefox, Safari, or Google Chrome. kscwgirl Cannot say enough good things about @scanmyphotos, they did an awesome job and are very very fast!!! Andrea Backstrom Smith Wow! I just received my shipment of 1000 scanned photos and I am blown away by the quick turn around time (5 days from NY to CA to NY) and the amazing quality of the scans. My photos were returned safe and sound (Thank you!) and the DVD of my photos is fabulous! I am definitely going to use your service again. I am so impressed! Thank you!!!! Click here to follow the conversation. Apple seemed to go out of its way to make photo viewing difficult, however, unless those images are already on the web or other Wi-Fi connected storage: the iPad itself has no slot for a camera storage card, or even a USB port. Apple is selling an set of adapters for those two functions, SD card reader and USB: the iPad Camera Connection Kit is $29 for two adapters that plug into the standard ‘iPod”-style docking port. When connected, the iPad launches its Photos app, allowing selected pictures to be imported. Also, when the iPad is synced to a PC or Mac, the photos on the iPad are added to the computer’s photo library. “With the iPad Camera Connection Kit, it’s incredibly easy to download photos from your digital camera to your iPad so you can view them on the gorgeous iPad display and share them with family and friends,” says Apple says.